Last year, we were lucky enough to take Anna with us on a trip to Washington, DC. Because we were invited to participate in the National Institute of Health’s study on XP (which is right outside of DC in Bethesda, MD) and because Libby had never been to DC, we decided to extend our trip a few days. We looked forward to seeing the sites in our nation’s capitol. We were a bit worried about how to visit all the places in DC while keeping Anna safe. Many of the monuments and other sites are outdoors. 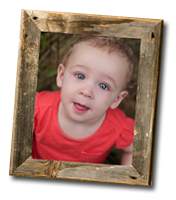 Having a genetic condition like Anna’s disease makes trips a little more complicated. Our immediate thought was to outfit a stroller with a big plastic sheild, protecting Anna from the sun and giving her a pretty good view out, as well. With velcro and clever measuring and cutting by Anna’s grandpa Boyd, a great cover was made. You can see that it worked pretty well! Knowing that August in DC can be extremely hot an humid, we were worried that Anna would basically be sitting in a little sauna each day. We didn’t want her to be cooked every time we went out with the stroller. To solve this problem, we bought one of those little portable fans with a built in water bottle. 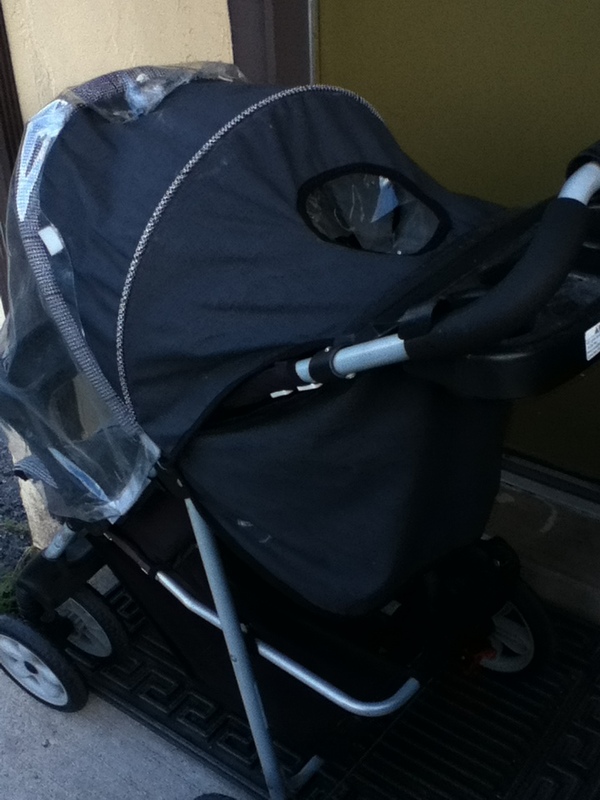 We cut a hold through a little window on top of the stroller just big enough for the fan to fit through. 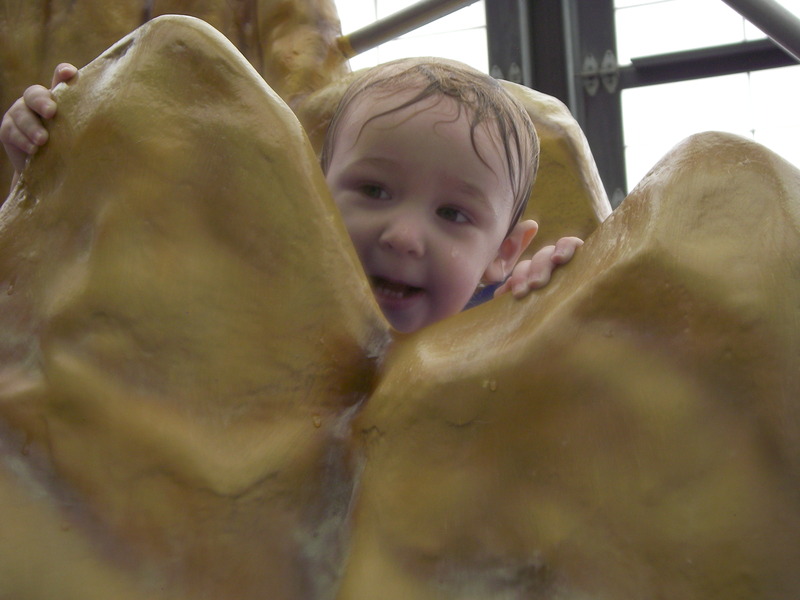 We were able to spray it once in a while and keep the fan on to move the air around insider her little bubble. I think it worked pretty well! 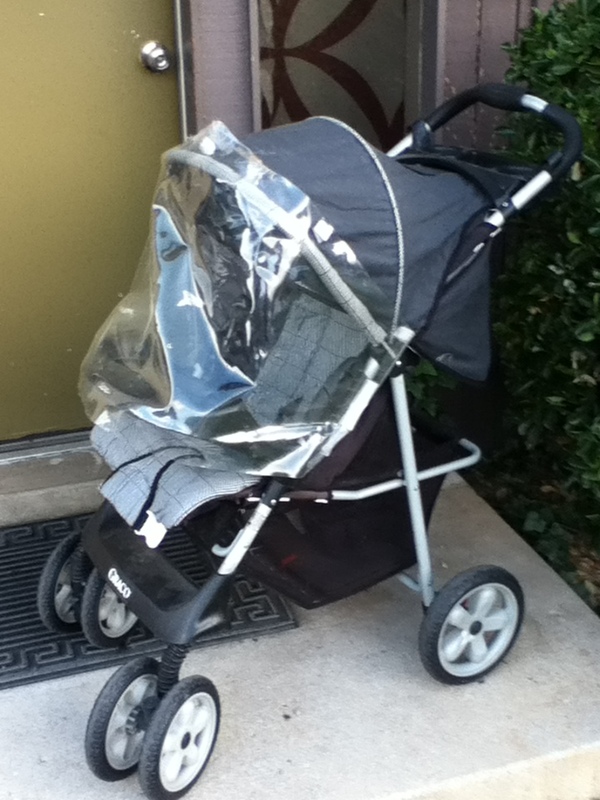 In fact, we’ve continued to use the stroller often since that first trip. Now we’re thinking about maybe using the UV blocking plastic to cover a bike trailer. 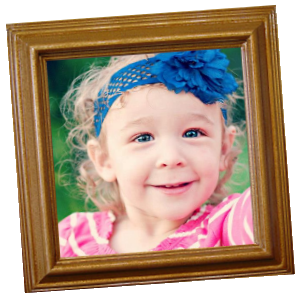 We are very grateful to the XP Family Support Group for providing us with the plastic to keep Anna safe from the sun. So…Is it Okay for Anna to be in the Shade? The answer is usually no – shade, umbrellas, and regular glass do not block the UV rays. 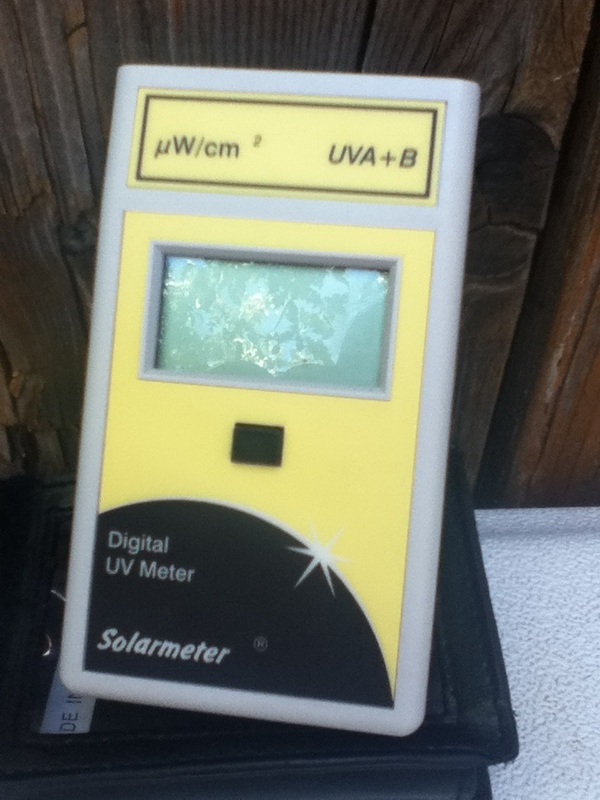 But when we really need to know, we have a marvelous tool provided by the XP Family Support Group – a digital UV meter. Isn’t it cute? 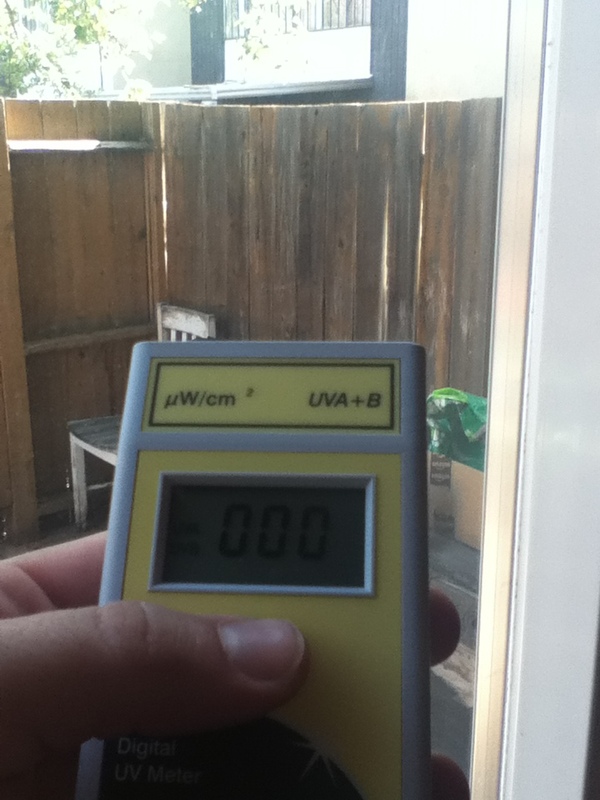 This handy device reads the amount of UV radiation coming from any given direction. We couldn’t live without it, especially when traveling to new places where we aren’t sure if the windows are sufficiently tinted and when we’re anxious to know if it’s safe yet for Anna to take off her hat at night. Here’s an example of how it works. 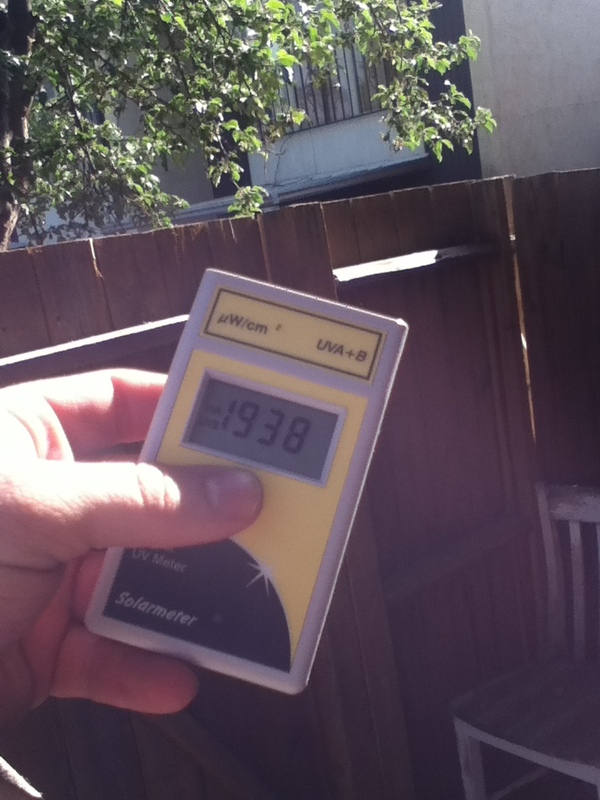 In this first picture, the sun is still up around 7:00 PM and you can see that the meter is reading at 1938. We strive to keep Anna away from any exposure over 10. So outdoors on sunny days is obviously very dangerous. After the picture in the sunlight, I took one step to the left in on our back patio, just into the shade. 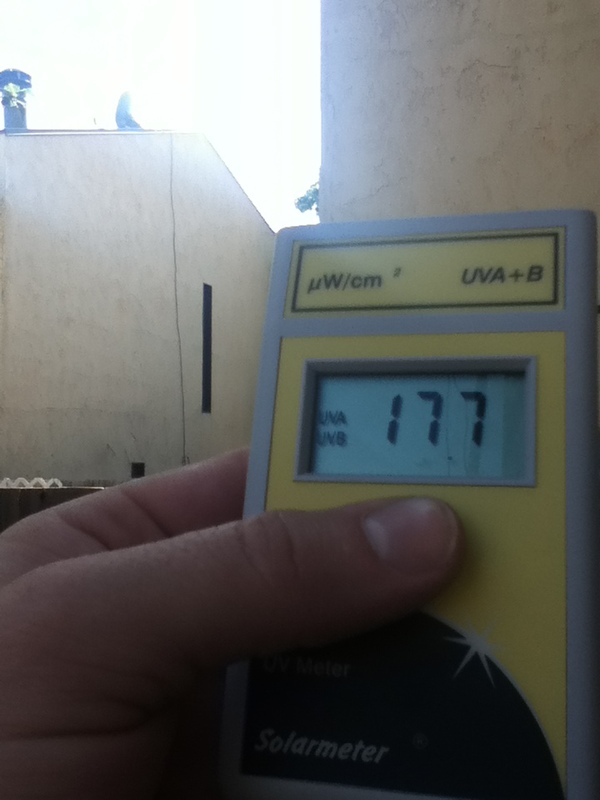 Now that the sun’s rays weren’t coming directly into the meter, the number dropped significantly down to only 177. But that’a still far too high for Anna to be safe. This is how we know that the shade isn’t sufficient. 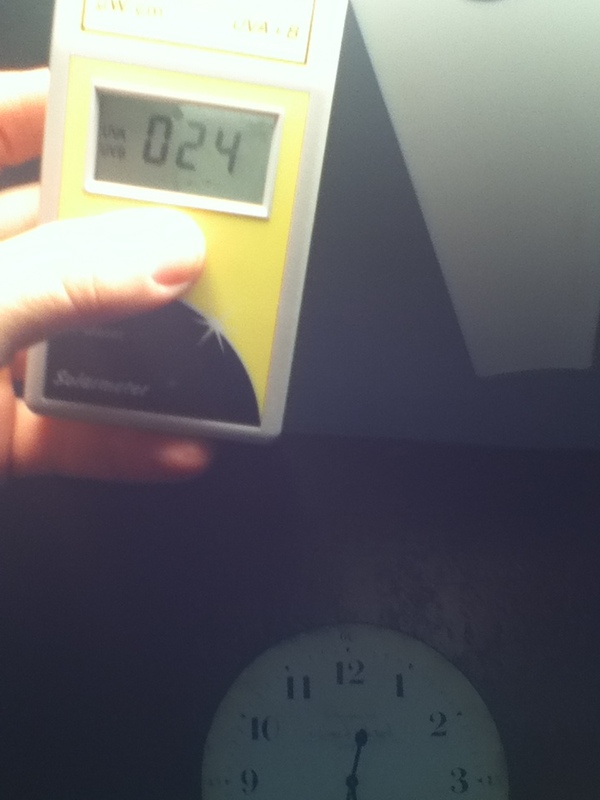 I then took a step inside behind our UV-blocking tinted glass sliding door, and pointed the meter outside. It read zero! We are grateful to allow the beautiful sunlight in our home while keeping out the UV rays. Now you know another little detail of life with XP. We’re very grateful to the XP Family Support Group for providing us with the UV meter. And now if you see us waving this little box around in the air, you know why. You may have clicked on this post thinking it could include some potty humor because of the title. And with a toddler in diapers, your guess is a very good one. However, today I’m keeping it clean, and posting how grateful I am for indoor plumbing that makes indoor pools a reality. 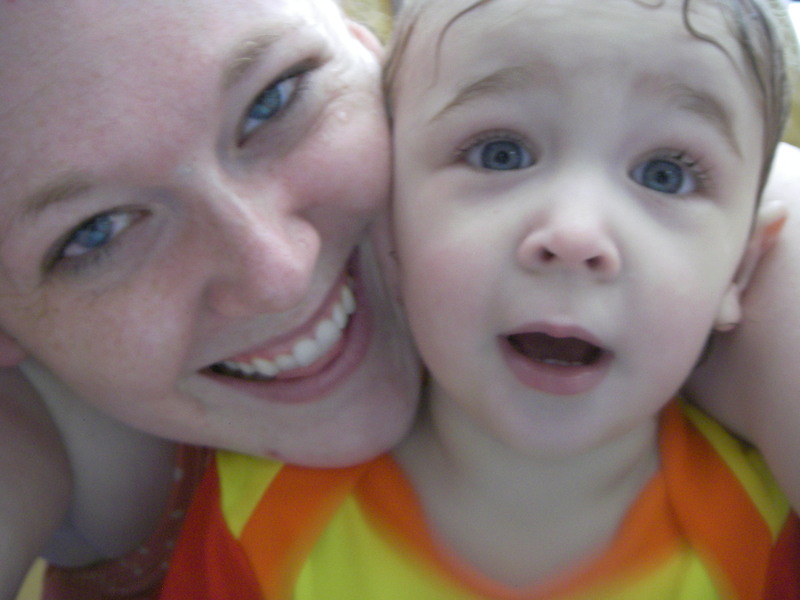 It’s a small thing, but one of the hardest things for me to think about when Anna’s XP disorder was confirmed was realizing that Libby wouldn’t be able to take Anna to a water park, beach or pool during the summer. 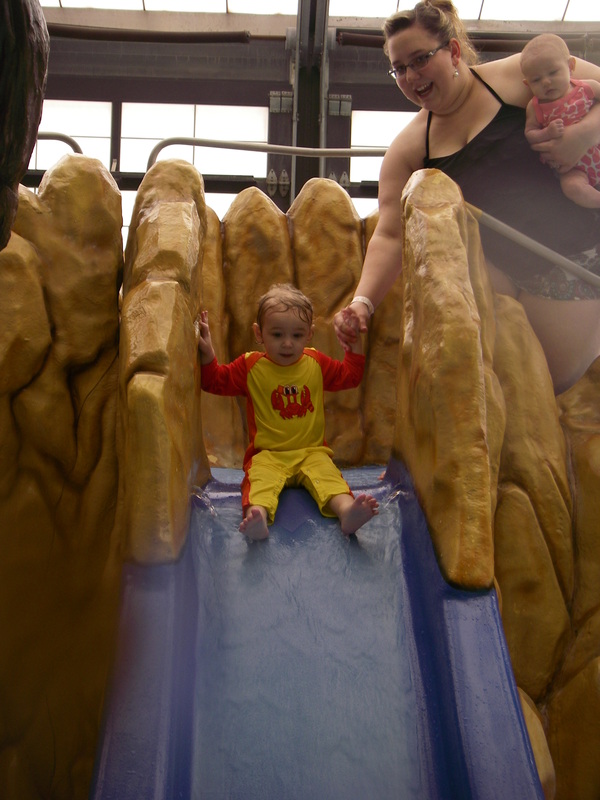 Libby loves visiting our local water park, Seven Peaks, and I know she looked forward to taking Anna there for fun in the sun with friends. 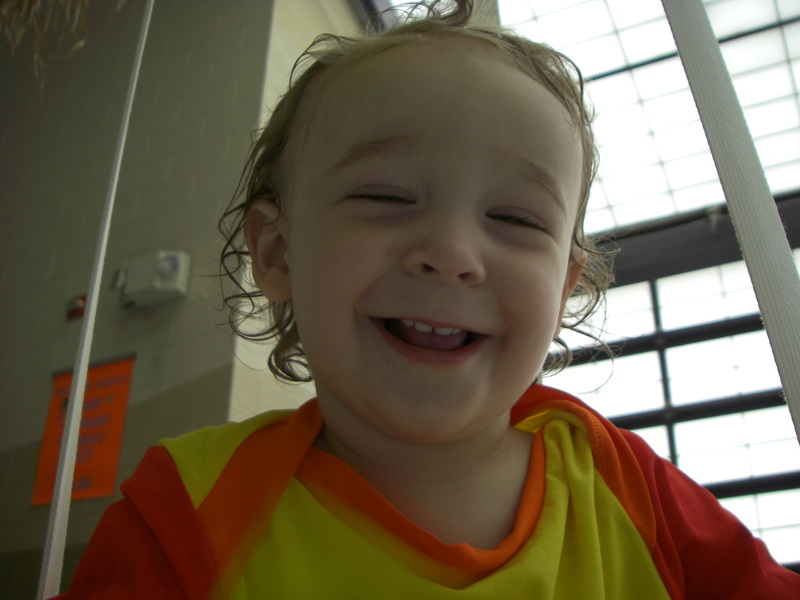 Because of Anna’s rare disease, swimming outdoors is really only possible at dusk and into the night. 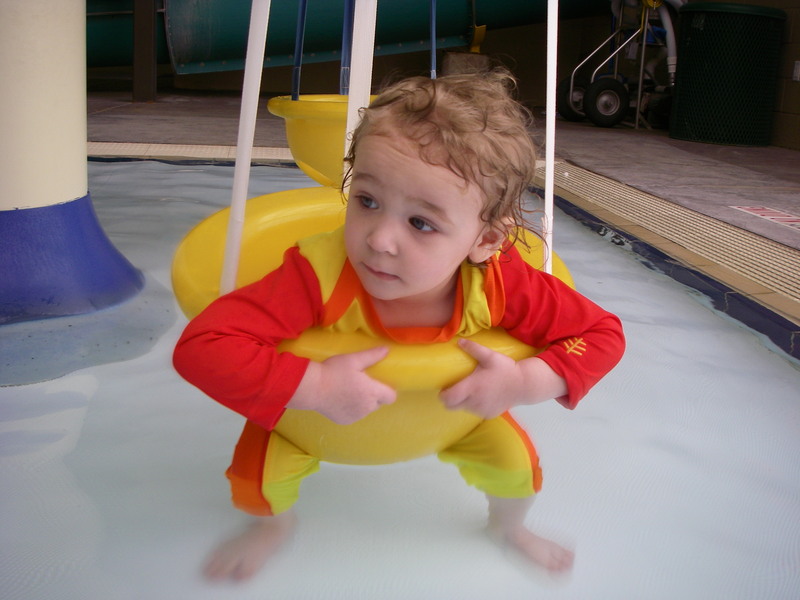 And most pools and water parks around here close well before it gets dark.